The new third-generation BMW X3 combines rugged off-road looks with a greater sporting presence. The new model brings in a new 2.0-litre petrol engine alongside the familiar diesel offering, plus a new performance flagship, the M40i – the first ever M Performance vehicle in the X3 line-up. The exterior dimensions of the new BMW X3 are largely unchanged, save for a longer wheelbase, long bonnet and short front overhang. At the front, the chunky three-dimensional kidney grille and LED fog lamps feature a hexagonal design for the first time on a BMW X model. Moving to the rear, the three-dimensional LED light clusters, downward-sloping roof spoiler and twin exhaust pipes further enhance the appearance. The interior of the new X3 follows BMW tradition with a driver-focused and ergonomically designed cockpit. Hexagonal forms and precise, bevelled edges are a distinct design theme. With ideal 50:50 weight distribution, a finely-honed chassis and xDrive intelligent all-wheel-drive linked to Dynamic Stability Control, the new X3 proudly shows off the handling characteristics for which BMW is renowned. 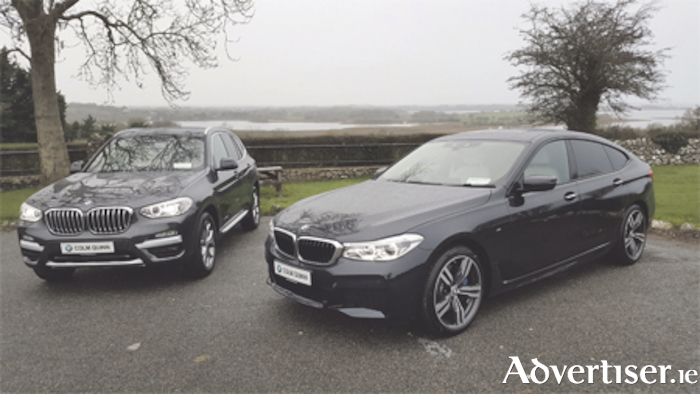 From launch, the X3 model line-up consists of the xDrive20d with four-cylinder diesel engine and the xDrive30d with a straight-six diesel unit. These will soon be followed by the xDrive20i engine variant, and the range topping petrol model, the BMW X3 M40i. All of the models available are equipped with xDrive intelligent all-wheel drive as standard. The system now features a lighter rear differential and a modified transfer case, aiding efficiency and helping with the car’s 50:50 weight distribution. The BMW 6 Series Gran Turismo sets a new level of comfort and elegance wrapped in a sporting coupé design, but now with superior driving dynamics and efficiency. Blending the luxury of a comfortable saloon with coupé looks, the 5 Series Gran Turismo was first launched in 2009. The new 6 Series Gran Turismo takes these characteristics so therefore can be enjoyed by 5 Series GT customers to another level and enhances the driving dynamics further. The new 6 Series GT design offers a more athletic, sportier stance. Vehicle height has been reduced by 21mm, while the rear end has been lowered by 64mm. The vehicle length has been increased by 87mm while the width remains the same. All these changes, while retaining the coupé/saloon characteristics of the predecessor, have contributed to a more low-slung silhouette without compromising on interior space or practicality. The lighter chassis and improved suspension have combined to improve handling and comfort. Self-levelling air suspension comes as standard at the rear axle, but for extra comfort, customers can opt for adaptive suspension, which features front and rear air suspension plus Dynamic Damper Control. Up front is a freestanding touchscreen for navigation, communication and infotainment functions. The centre console again features the iDrive Touch Controller dial, while standard-fit enhanced voice control enables total hands-free capability.